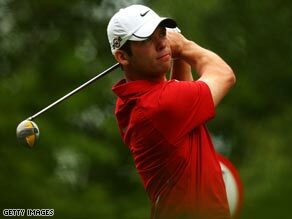 (CNN) -- Paul Casey will climb to third in the world behind Tiger Woods and Phil Mickelson on Sunday if he becomes the first golfer in a decade to complete a double in top European tournaments at Wentworth. Casey has looked relaxed at Wentworth in his pursuit of the PGA title and third place in the world rankings. British star Casey, who won the Matchplay in 2006, goes into the final round of the BMW PGA Championship with a three-shot lead over Dane Soren Kjeldsen. Not since Colin Montgomerie in 1999 has any player won both the PGA title and the World Matchplay title at the Surrey venue. In-form Casey won on the European Tour in Abu Dhabi earlier this year and recently recorded his first US PGA Tour victory in the Houston Open. "I am hitting the golf ball where I want to," said Casey, who would have led by five had he not missed two short birdie putts on the last two par fives. "It's nice that all the hard work I have put in this year with my coach is starting to pay off. "And if I could win and move up to third in the world rankings that would be great. It's one thing I have been focusing on a lot this year -- trying to accumulate as many ranking points as possible -- and with 64 of them available this week it's a big prize." Kjeldsen is also a man in top form having recently won the Andalusian Open and climbed to 45 in the world rankings. He completed a third-round 68 with a magnificent birdie at the 18th, playing an awkward bunker shot and then sinking a 25-foot birdie putt. A shot further back from the Dane is young Northern Irishman Rory McIlroy, who if he should triumph at the age of 20 years and 20 days would be the youngest ever PGA Championship title winner. McIlroy shot a seven-under-par 65 to move to nine under and afterwards revealed he had curbed his natural aggression to work his way into contention. Should McIlroy succeed in adding to his debut tour victory at the Dubai Desert Classic in January he will move into the world's top 10 when the latest world rankings are published on Monday morning.